The invention of newspaper started during the ruling period of the kings. The objective of these newspapers was to bring forward the latest news from the north, east, west and south of the kingdom. However, variations and modifications are the key of survival in the living world. The newspaper that we see today is a result of the variations and modifications over the years. A newspaper is of great importance for the business sector. It is a mode, which the companies use to issue job vacancy advertisement. Here are some of the disadvantages and advantages of advertising in a newspaper are discussed below. A newspaper is a term formed within the boundary of four criteria. The criteria’s are accessibility, periodicity, universality and update. It is an accessible source for the majority of the people. It is published on a daily note, which makes it possible to acquire information at regular interval. It covers various niches, which marks the flexibility of the newspaper. Lastly, it reflects up-to-date stats of the world. The word ‘news’ stands for north, east, west, south. The newspaper covers various articles, reports and advertisements based on political, events, business and finance, science and technology, entertainment, weather reports, mishaps, unfortunate incidents, etc. Newspapers not only covers the news of the business world but also becomes a platform to provide advertisements. Recruitment refers to the function of Human Resource management, which includes advertising, selecting and assigning a suitable candidate to the company. The process of recruitment and selection process is further divided into 3 steps. Job description analysis is the initial stage of recruitment. Here, the HR manger analysis the skills and knowledge that is required for the job. Each job description differs according to the position. Some companies prefer an experienced candidate and some give opportunities to the beginners. Hence, the job requirement list is formed during the process. Once the HR analysis the description they plan the advertising strategies. Advertising strategies matter the most. Compared to the olden times, advertising a job vacancy is a relatively easier job. Various available means make it possible to reach more candidates in lesser time and budget, thus making recruitment an easy step. The final stage of the recruitment process includes two steps i.e. the interview and the selection. Various candidates apply for the job depending upon the qualifications and the requirements. These candidates receive a confirmation call or mail for the interview by the HR management. The recruitment staff conducts interviews. Later, depending upon the interview results and observation the deserving candidate receives the job. Although the above steps seem like an easy process, it is indeed the opposite. The recruiting staff and the HR management need to consider various factors before recruiting. Once the description analysis is completed, the biggest question that arises is that which mode is suitable for the company to use for advertising. Recruiting strategies is a very important process in any firm. Thus, most organization with a big budget may contact agencies to do the work. These recruiting agencies advertise the vacancy in a profitable manner. They may post it online or through the written forms like local newspaper and national newspaper. This is a largely used format of job vacancy posting in the recent times. It makes it easier for the people to reach. Moreover, due to the e-development, it has become possible to approach comparatively more candidates in lesser time and budget. In addition, various sites have developed in the recent years that give an opportunity to the job seekers to apply. This mode of advertising is an ideal deal as long as the approach is for an international or multinational firm. Newspaper vacancy advertisements are the oldest form of advertising. Like the online format, the newspaper is efficient over a large area. However, it is also equally effective in the local area. Local newspapers are distributed in the locality and are read by almost everyone. They are flexible and cover many niches. This is the advantage of newspaper advertising. It works well for the small-scale companies with fewer budgets, it is one of the advantages of newspapers. Selecting the deserving candidate to vary according to the means of advertising ideas. Newspaper advertising pros and cons are common like other modes of advertising. No matter which mode of advertising you chose, they have their own pros and cons. However, we are subjective to our choices. 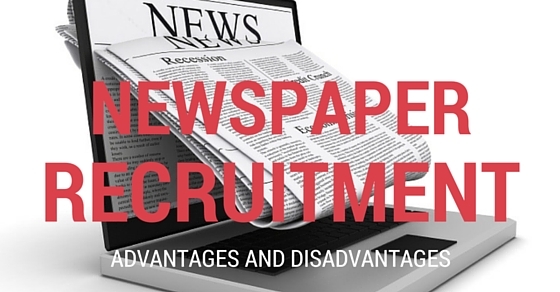 Let us have a look at the advantages of the newspaper recruitment. With the advent of technology, organizations and firms count the newspaper recruitment stage as obsolete. However, there are certain advantages of the newspaper recruitment that you cannot neglect. Local newspapers are the papers that cover the news of the international level. However, the people of the same geographical region read the news. There are certain jobs that require experience and knowledge of the locality. For example, the job of the tour guide. Tour guides require the knowledge of the locality. Thus, the people of the same region with required qualifications are the target. The job of sales man also requires the knowledge of the people in the locality. These are some of the advantages of local newspaper advertising. Therefore, placing the advertisement in the local newspaper serves as a profitable and efficient deal. Well, the newspaper is a budget friendly mode. It is flexible for the use. Depending upon the budget you can vary the size of the advertisement. Mentioning a few lines is more than enough to place the ad. However, if the budget permits you can go for an ad with a picture relating to the firm. Alternatively, you may place the ads under the topics like sports, comics, classified, etc. This increases the possibilities of more attraction from the job seekers. As the odds of qualified candidates increase, there are more options for the interviewer to select a deserving job seeker. Comfort and convenience walks side-by-side. Why do you think that the invention of laptop was possible? Well, the wireless technology is a solution to the dozens of wire connections and its trouble. It makes our life easier. Similarly, newspaper makes life easier. Nevertheless, how is that possible? As I said earlier, comfort and convenience walk together. You can access a newspaper at any time and anywhere. Unlike the online jobs that require tools like PCs, laptops or mobile phones, newspapers are convenient. Thus, the written form is more convenient compared to the broadcast media generated ads. What do you mean by 80s below? By that, you mean the people of 1980s and below. In today’s time, the ones who are not used to technology read the newspaper. If the targets of your ad are these people then newspaper is the perfect way to approach them. This will work effectively for everyone. Well, you saw an ad on a site then you switched on to a different site. Then you moved to another site. During the course of switching from site to site, you saw various ads. However, there are already too many bookmarks saved in your computer. Forget about those ads now. Well, a newspaper is actually a solution to the complication. Newspaper avails the reader to cut out the ad or mark it, in order to sort out the vacancies. It is an efficient and comfortable for the seekers. Approach and reach matters a lot in the business firms. However, one more factor needs your consideration in the process i.e. time. If the ad that you have posted has a time condition or is a limited period vacancy then you receive more application. People receive newspaper on a daily or weekly basis, thus, the job seekers reciprocate as soon as they read the post. Therefore, it saves a good amount of time. Therefore, job vacancy advertisement in newspaper is not as bad as it seems. However, nothing is limited to advantages only. A few disadvantages of advertising come along with the idea of newspaper recruitment as well. Did you read a newspaper this morning or yesterday morning? You have not read newspaper at all in the last few days. Well, it is a very common scene with most of the population today. As a fact, it is not a surprising thing either. With technology, newspapers have also opted for an upgrade as so have we. People who want to know the news may switch to various sites for e-news. Similarly, most of the corporate world matters are handled online thus, many websites have been developed that offers a platform to post an ad as well as apply for a job. Thus, newspaper falls short in this area. The scope of any medium is limited unless you target more than one source for the required job. Similarly, newspaper limits is effectiveness over a certain geographical area. Moreover, you cannot post ads in various cities in the country. It is impractical and costs a lot. For example, if you place an ad in ‘The Nashik Times‘ then the people of Nashik will only view it. Thus, the response of the applicants will be limited to Nashik only. Therefore, newspaper fails to be effective over a larger area. The newspaper is after all a paper. The lifespan of the paper depends upon the user. Job seekers usually read a newspaper once and then discard it. Moreover, the ads in the newspaper usually have a limited period vacancy. If an applicant views an ad after a day or more then there is comparatively less chance of the diverse response from the job seekers. Moreover, it is not a profitable deal for the organization as well. A newspaper has various ads, thus, it a difficult task to ensure that the targeted audiences have referred to the ad. Also, if a person spends a few minutes to read the entire newspaper it means that the person barely gave a glance on the ad. What do you do when you like a book at the bookstore? Well, you buy it to read later. However, the journey of that book did not start from the bookstore. It started as rough draft, which was modified and polished. Later the author sends it to the publisher and so on. Similarly, an ad reaches the readers as soon as it published. However, the stages before publishing are time consuming. Moreover, if the advertisement is published in a weekly publication then it will take relatively more time for the job seekers to view. 5. Do you need a magnifying glass? The other day a five-year-old child was using his fingers to enlarge his mini nursery rhyme book. Well, I am not highlighting how technology has had an effect on him. The child may be doing so out of habit however, you may too wish for something like that when you see the tiny script of the newspaper. Mobiles and camera have the feature to zoom the texts whereas the newspaper does not. Tiny script may be very irritating to read. Thus, it decreases the odds of applicants viewing the ad. Moreover, on the part of the applicant it is a sheer loss of opportunity. Newspaper has been a significant mode or source of various news and ads in the late 19th and 20th Century. However, in the beginning of 21st Century digitization started ruling the globe. The youth have chucked the use of the traditional form of job searching source and have switched to an advanced mode. The e-recruiting system has rooted itself into the core of corporate world. However, you cannot ignore or neglect the newspaper recruitment method. The choice is subjective and is based on the analysis of the requirements of the organization.